Our popular BMW M50 Valve Kits have the necessities for your valve job. 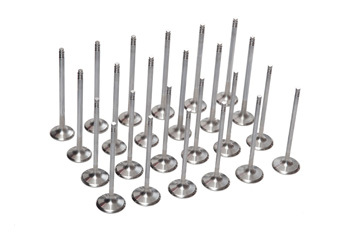 VAC Forged Stainless Steel Valves are precision made to exacting specifications and are suitable for both street performance and full Race vehicles. Our valves have been proven to work great in street vehicles for day to day use where engine build up and byproducts can harm typical "race valves", yet these valves have proven their worth on max performance all out race engines, surviving lap after lap, race after race, and even multiple seasons without being replaced! As the M50 and S50 engine are under 3-liters, they typically breathe fine with most camshafts on mild builds, but since the S50us and S52us sepc M3 engines use the same heads and valves, we have found great gains when fitting even mild S50 and S52s with these better flowing, and lighter weight valves. Triple or Single groove stems to go with your application. These valves are a must-have when building a high performance and very high revving engine: They dramatically reduce valve weight and this improves valve train reliability greatly as the valve springs do not have so much mass to control. Crucial on the M50 family of engines like these. Over-sized valves can help enhance maximum engine output, a great upgrade with 264/256 and larger cams. From Andrew Felsher of Trumbull, Connecticut on 7/19/2010 . VAC High Performance Valves are custom made to our critical specifications. Call if you need valves or engine components for any BMW.